Whether you’re following along with Big Brother and looking for a way to save as you “Click to Buy” or you’re simply a style-savvy shopper with an eye for a bargain, you can’t go wrong when you start your search for the perfect new look with a Very discount code. Don’t miss the chance to save big on all your favourite products, and pick up your Very voucher codes today! Formerly known as Littlewoods Direct, the brand that has become Very began as a home shopping catalogue and retail emporium headquartered in Liverpool. 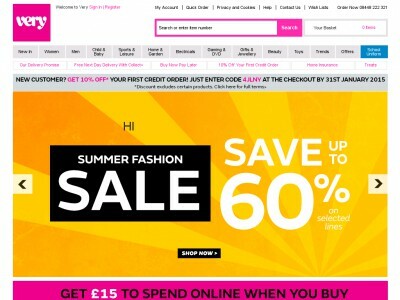 When Littlewoods Direct was bought by the Barclay brothers in 2002, the enterprising pair rebranded to appeal to a younger market through a strategy of online retailing. When the new Very website launched in July 2009, the seeds were sown for the integration of video and images, and by 2010 a mobile version of the Very online shop was enabled. Even without a specialized app for Android or iPhone, by 2013/14, more than one third of Very’s online sales were made on mobile devices. Furthering the appeal to a young, mobile hungry, pop-saturated, demographic, Very regularly makes use of celebrity endorsements such as a capsule collection from former Girls Aloud member Kimberly Walsh in addition to sponsoring the annual V music festival and initiating innovative product placement arrangements such as the “Click to Buy” program you can find while watching Celebrity Big Brother on Channel 5. Whether you’re in the middle of a key moment on Celebrity Big Brother or just searching the web for a new look, now’s the time to shop online with your Very discount code. Begin your search for…well, really anything you could possibly require at the Very online shop. Browse by category or search for exactly what you need with your Very promo code in hand until you see something you like. Click on any of the items that interest you to read up on the details and think over whether or not this is the way to make the best use of your Very discount code. Look over your order, and if you have everything you need click “Continue Securely” and either log in to an existing Very account or click “Register” to checkout as a new customer. Enter your personal details and click “Continue” to set up your Very account or choose to pay by credit or debit card if you’re not interested in a payment plan. Update your delivery details and choose how you’d like your order shipped before continuing on to redeem your Very discount code and make your payment. To redeem your Very voucher code, enter your Very promo code in the box provided, and click to apply your Very discount code to your order. When you’ve secured your Very discount code, make your payment (if necessary) and complete your order. couporando.co.uk offers always fresh 24Studio vouchers. If not, visit Fashion, Accessories & Jewelry category and choose another nice rabate for stores such as Argos, House of Fraser and Littlewoods. Navigate to the Very online shop with your Very voucher code and let the search begin. Browse the incredible selection from furniture to furbies with your Very promo code in hand. Whenever a particular product sparks your interest, click to learn more and consider whether this is really how you want to make use of your Very discount code. Review your order to make sure you’ve found everything you came for, and then click “Continue Securely” and choose to log in to your Very account if you already have one or click “Register” to checkout as a new customer. To set up your new Very account, simply provide the requested personal and contact details and then click “Continue” to choose either a Very payment plan or payment by credit/debit card. Provide your delivery address and select how you’d like your order delivered to you before you continue to the final stage of the checkout process and secure those Very discount code savings. To redeem your Very voucher code, simply input your Very promo code where applicable and where necessary choose to apply your Very discount code to your order. When you see your Very discount code savings reflected on your order, either simply confirm your order or make your payment and congratulate yourself on a successful shopping trip. All finished shopping and ready to check out? Just make sure to redeem your Very voucher codes before finalizing your purchase! Collect+ is available for next day delivery free of charge. Standard Next Day Delivery is available for £3.95. Nominated Day Delivery is available for £4.95. Standard Delivery of TVs & White Goods is available for £6.95, for all other goods Standard Delivery is £8.95. Express Delivery of TVs & White Goods is available for £16.95, for all other goods, Express delivery is £18.95. Within 28 days of receiving your order, parcel up the unwanted items along with the returned goods note for each item you are returning. Stick the enclosed returns address label over the original label and return your parcel to Very. Why navigate the rough and windy seas of style on your own when the Very customer support team is always more than happy to help? They can answer any questions you may have (including how to redeem your Very discount codes), so don’t hesitate to contact them if you have any questions. Don’t forget to check them often, as you can never be sure when a free Very Discount code might be waiting for you! Buy now online at www.very.co.uk.